Magnetic loop antennas are often called constant current loops, which means received signals provide a uniform current flow around the entire loop. Is this assumption realistic? Small loop theory assumes uniform current around the loop. There has been a lot of controversy about whether or not the assumption that small magnetic loop current is uniform around its circumference. The answer is somewhat. 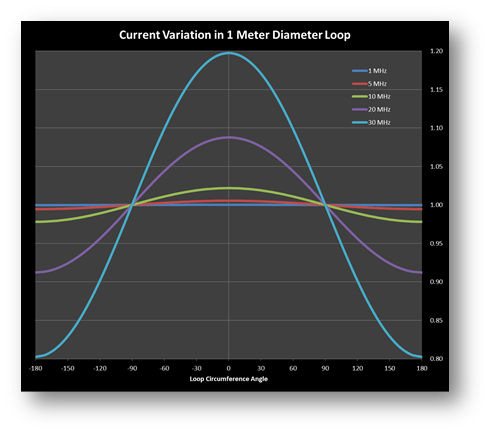 You will find the importance of the constant-current assumption relates to the receiving pattern of the loop. Under the assumption of uniform loop current, loop antennas produce a dramatic broadside null in their receiving pattern. In fact, with constant current, the pattern null at 90° is pretty much infinite. Users can enjoy wonderful directional characteristics from this null. On the other hand, as loops become larger relative to wavelength, the broadside null widens and widens. Eventually, when the loop circumference becomes equal to wavelength, the pattern has shifted with the now broader null moving to end-fire rather than broadside. So, how constant is the current around my one-meter diameter loop antenna? My loop is being designed to cover roughly 540 kHz to 30 MHz. How constant is the current from the received signals across this range? You will see the answer in the above graphic. Where loop shape is less than around 10% wavelength, current is nearly constant, within a few percent. As frequency increases, and the loop size is more like 20-30% wavelength, current is not uniform and can vary as much as ±20%. So, basically, pattern directivity and null will be pretty good below 20 MHz, particularly below 10 MHz. So, if you are operating your 1 meter loop at 10 MHz or lower, the uniform current assumption used by many of the analytic formulas pretty much holds. Generally, near constant current is achieved with a circumference less than 20% wavelength. A more thorough description of loop currents can be found in QEX, Jul/Aug 2018. Hopefully this puts the controversy to rest.